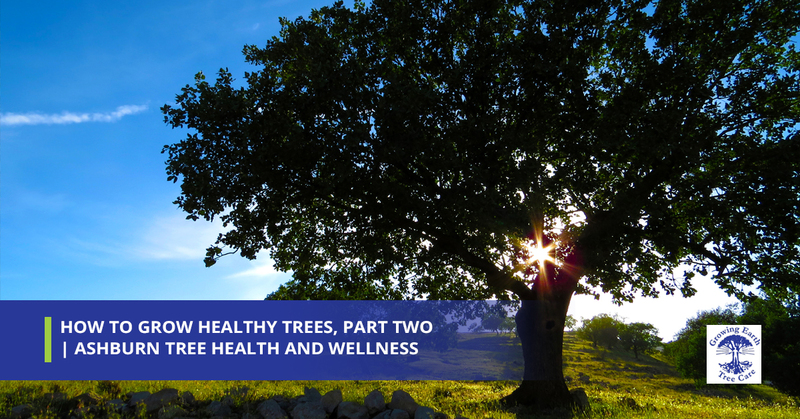 In our last article, we introduced how you should go about the process of planting, maintaining, and growing healthy trees. There are many different factors that go into such an undertaking, and perhaps more than the layman (or laywoman, to be fair) would typically realize. Among these factors worthy of consideration is a suitable environment for your selected tree type, in terms of both environment and planting location. In today’s post, we will continue with this two-part series by picking up right where we left off. Keep in mind that although we (your friendly certified arborists here at Growing Earth Tree Care) are here to help assist you for any and all of your tree maintenance needs, we would much prefer you to get started off on the right foot when planting trees in your orchard, new backyard, or whatever the case may be. Picking a healthy tree and location for that tree is the first step to healthy tree care. There a few different things to look out for when selecting a young tree from the nursery. Container Grown Trees – You don’t want a tree that is bound in roots within the barrel or can. It’s a good idea to cut any “circling roots” upon planting the tree. Of course, you’ll want to remove the tree can before planting (just in case there is any confusion on that point). Balled and burlapped trees (B&B trees): Look for a firm soil ball, with a trunk tied securely tied down. Additionally, in transport you should be careful to carry the tree by the soil ball rather than the trunk, or heaven forbid, the limbs or branches. If you don’t want to wait half your lifetime for the tree to reach a good height, perhaps purchasing a more mature tree is the ticket for you. This could also be helpful for people involved in city plantings in a park, for instance. Here is a quick list of some tips that will send you in the right direction. Most people know that healthy tree roots are indispensable to the wellbeing of any tree. What most people don’t know is how to ensure their tree’s root health. The first thing you should note is that roots need oxygen to thrive. Thus, the soil around the newly planted tree must not be packed in too tightly. Additionally, compact soil often impedes water flow, which only compounds the problem. The critical root zone, or CRZ, is important to remember here. This is the area defined by the circumference of the trees limbs, extending downwards, beneath the ground. Although a mature tree’s root system extends beyond this imaginary zone, the CRZ is the area which merits the most attention. The main point to remember here is that you must not compact the soil within the CRZ. This North Carolina graphic helps illustrate a standard CRZ. Protecting tree bark is an underrated aspect of proper tree care. Think of bark as a tree’s line of defense against anything from wild animals and insects to bacterial infections. Here are a few common backyard objects that you should be aware of. Rubbing branches – obviously the friction is the main source of concern here. Make sure your branches are properly pruned every year to ensure your tree remains in good health. Lawn equipment – weed wackers specifically are an issue we see far too often. We get it, you want to have that perfect shave so your lawn is looking great. But don’t risk it at the expense of slicing away the bark at the base of your tree. At the end of the day, it’s a simple cost-benefit analysis. Water Your Trees Intelligently – but don’t over-water them. Mature trees don’t need special watering during the winter – even it is a dry one. In the heat of the summer, however, give all your trees a deep drink, as opposed to a frequent light sip of water. Since 1976, we’ve been Ashburn and Northern Virginia’s experienced and knowledgeable tree care experts. If you are looking for certified tree arborists who care just as much about the health of your trees, Growing Earth Tree Care are the tree pruning and tree removal experts who can help you out. After all, we’ve been in business for over 40 years, so that means we are doing something right. Whether you are looking for tree pest control, soil care advice, or emergency tree removal, we’ve got you covered. To find out what we can do for you and your yard or orchard, reach out to us today for a free estimate. We would love to hear from you. Call your local tree care company today!